Malware infected Jazzy007's PC, and his data disappeared--even after he removed the culprit. He asked the Answer Line forum for help. Chances are your data files are still on your hard drive; they're just hidden. The criminal who created that malware wanted to scare you into thinking that your precious files were gone. After all, in your panic, you might do something stupid--preferably something that involved throwing money in their direction. And the easiest way to create the illusion of missing files is to hide them. In Vista or Windows 7, select Organize, Folder and search options. Click the View tab. 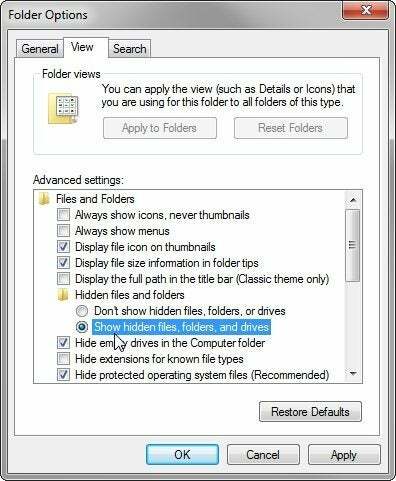 Select Show hidden files and folders (Vista) or Show hidden files, folders, or drives (Windows 7). In XP, select Tools off the top menu, then Folder Options. Click the View tab, and select Show hidden files and folders. Once you find the files, select them all, right-click the selected mass of files and folders, and select Properties. In the Attributes section at the bottom of the resulting dialog box, uncheck Hidden. In the unlikely event that they're not hidden, they're still almost certainly recoverable--even if they're not in the Recycle Bin. See Recover Missing Files for more advice. Finally, you can always restore them from a backup--provided you've been backing up your data on a regular basis. And if you haven't been backing up regularly, why not?